The prime motive of corporates today is to look for potential customers using smartphones. Mobile phone users are increasing at a rapid rate. As per some reports, worldwide users will touch the 3 billion mark by the second quarter of 2020. To enhance user interaction and UX, companies are investing a huge amount of resources and money in building Progressive Mobile Apps. In this digital age, almost everyone is linked with the Internet in some way or another. A large number of people can’t even imagine their life without these applications. Hence, companies those who want to be in the competition left with no option available other than Progressive Web Application. It merges the best components of the native applications and mobile sites by minimizing their flaws. 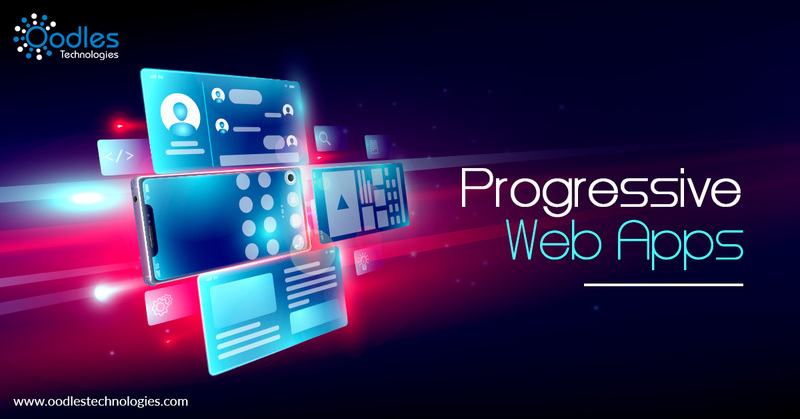 Progressive Web App is a mobile-based application produced through the internet, it runs like a native application that provides an app like navigations and gestures. It can directly run on the web browser, there is no requirement to download the application from the app store. Another essential characteristic of this application is that it loads frequently, even when the connectivity is low. As we know users invest most of their time on native applications because it provides even experience and user engagement. Considering all these points, the community of developers has come up with the concept of Progressive Web Apps, which is an association of Native and Web application, with huge experience of native applications. There are various constraints which application developers are facing while developing mobile applications. To handle such constraints, developers are using PWAs, because it is providing the same characteristics and features to the website and also it gives users an advantage that they don’t have to download the app for using it. This is not the only factor which is making it unique from others. It also has some other features which are making PWAs better. Runs speedily: It is speedier than others, it lets the content loads speedily, and provides even experience to the end users. Smoother experience is the reason why PWAs are the hot choice of users. Reliable and engaging in nature: It is reliable because it offers interface, no matter whether the internet connectivity is good or bad. Due to this, consumers feel more connected with the application. Advanced: PWAs are always updated because Background Sync API sends cyclic or time to time updates on the server so that the mobile application can be updated when the user is online. Safety and Security: PWAs safeguard users from unofficial access because it uses HTTPS. HTTPS has more secure and encrypted security layer. This has made it a safer and more reliable option for users. Easily Traceable: They are also easily traceable by most of the major search engines. Sends Push Notifications even if the application is not running: Some other crucial reasons why it is popular amongst the developer community is push notification. A user is going to receive the push notification, no matter whether the application is running or not, because PWAs run in the background. Earlier, people have a habit of switching one website to another very speedily. Poor UX and UI of the websites were the primary reasons behind this, hence users won’t find smooth experience while using them. But on the other hand, installing Applications for every single task was also not easy. PWAs are the one ultimate solution for these problems. They provide smoother user experience without installing applications. We are one of the best Web and mobile application development service providers around the globe. For building PWAs or other mobile application feel free to call us.